Haydn wrote some fifty-one piano sonatas, and a number of other mainly shorter pieces and collections. But while he became known as the ‘Father of the String Quartet, and the Symphony’, no such epithet was ever assigned to his piano music. In terms of the sonatas, most were written in his early years, and, since he wasn’t really a pianist per se, he lost interest in the genre, as his career developed. In fact, only three sonatas were written in the last twenty years of his life. Furthermore, his keyboard music was at first written for the harpsichord, with later works clearly intended for the pianoforte, as their dynamic markings suggest. Coming some forty years before Beethoven, Haydn’s career coincided with changes in keyboard instruments, as the fortepiano, and then the pianoforte – with their fundamentally-different hammer action – replaced the erstwhile harpsichord and clavichord. These changes in the hardware also came at the same time as formal changes were taking place in the music, and particularly the opening movement of a piano sonata, and by analogy string quartet and symphony. This new release from Naxos – featuring the seemingly indefatigable Hungarian pianist Jenő Jandó – is subtitled “Arrangements and Dances” in the succinct but sufficiently informative sleeve-note. However, it opens with Haydn’s Fantasia in C, which is neither an arrangement, nor a dance, but is probably the composer’s best-known standalone piece for pianists. In 1789, just at the age of fifty, the composer offered his publisher Artaria a Capriccio in C, which Haydn felt would suit both the accomplished amateur, as well as the practised professional – which status could well be ascribed to his own technical prowess at the keyboard. The Fantasia, as it became known, is, in fact, a work of some brilliance and virtuosity – even if the latter is not of the extreme variety – and makes extensive use of its cheerful, catchy opening theme, which goes on to involve lots of hand-crossing, and effects which the instrument was able to achieve, especially in terms of sustained sonority, something which was not available on the harpsichord. There are many moments along the way that look towards Schubert, especially in some interesting harmonic juxtapositions, and the use of major and minor tonalities. Jandó’s highly-assured playing captures the spirit of the writing to perfection, particularly in the relatively unassuming way that Haydn might also have performed it. No unwanted histrionics here, simply for effect. This is followed by the only other single work on the CD, one which does come under the umbrella of an arrangement. The Adagio in G major is a slightly different, earlier version of the slow movement of the Piano Trio No 22, a work dedicated to the wife of Esterházy’s last patron, where Haydn ultimately became Director of Music. With its plaintive melody and largely triplet accompaniment, which also filters into the right-hand figuration, Haydn maintains the listener’s interest with some effective harmonies and modulations where, once again the spirit of Schubert can be felt in the shadows – simple in concept, but a charming miniature, nonetheless. The 5 Variationen in D are from some forty years earlier, and the style is very much more suited to the harpsichord, with a greater use of ornamentation. The Andante theme is firstly followed by a syncopated version between the hands, while the second variation sees somewhat more rapid movement in the right, which turns into more continuous semiquaver writing in the third. The fourth reverts more to the pattern of the second, while the final variation returns to semiquavers to add momentum, although the close is simple and understated. The 12 Deutsche Tänze were originally heard in orchestral form, for a masked ball at the Redoutensaal in Vienna’s Hofburg Palace, in aid of the pension fund for widows and orphans of the Society of Visual Artists. The Empress herself asked Haydn for a keyboard arrangement of the dances, and, of course, he was happy to oblige, not only to keep in her good books, but also to provide some readily-approachable Unterhaltungsmusik, or Easy Listening. Even though Haydn doesn’t have a lot of room in which to manoeuvre, he manages to keep us entertained throughout these 12 German Dances, largely by varying each successive key used, and their individual structure. In terms of the former, there is no recognisable pattern as such – the first dance is in G major, and the cycle ends in D – and, as for the latter, it is essentially a matter of the respective number of internal repeats, and whether a Trio is added. The 18 Menuetti were also apparently performed at a Redoutensaal ball, and Haydn made a similar keyboard version, to which a single Aria in F, possibly intended as a sonata movement, is tacked on here. What the composer managed with the 12 German Dances, he at least equalled here with his Menuetti. While both forms share the same triple-beat time-signature, Haydn makes a noticeable stylistic distinction between them, which reflects their basic origins. Minuets were danced by the nobility up at the castle, while German Dances, more akin to folk music, were for the bourgeoisie down at the local tavern. Haydn reserves a good deal more ornamentation and more stately lines for his Minuets, whereas the Dances are considerably less restrained – and somewhat more fun. Once again, the composer packs a great deal of variety into essentially 19 Menuetti, once more achieving this by variety of key, tempo, and length. It does, however, come as a considerable relief when, in the tenth Minuet, Haydn adds a trio in the tonic minor key. The Zwei Märsche are a product of the composer’s second London visit, and were written for the Derbyshire Cavalry Regiment. Originally composed for Wind Band, Haydn is thought to have made the present keyboard version. The 12 Menuetti with which the CD ends, now survive only as pieces for keyboard, while, like the 12 Deutsche Tänze, they also featured at the Society of Visual Artists’ Ball. As with the 18 Menuetti, Haydn ventures just once again into C minor, for the Trio of No 10. This is an enjoyable disc and combines a couple of the composer’s more significant standalone keyboard pieces with some light-hearted fun pieces, which, in the latter case, make little, or no intellectual demands on the listener. In my mind’s eye, for example, as a teacher I could see a team of two young pianists or more trouping up to play through the collections at a students’ soirée, or similar. 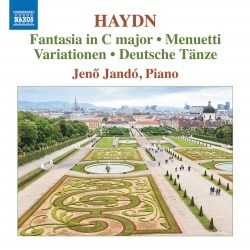 At the Naxos price it is certainly well worth considering – and if you have already invested in Jandó’s 10-CD Set of Haydn Complete Piano Sonatas on the same label (8.501042), then it might almost be considered obligatory.